Acupuncture is a part of energy medicine based on balancing out energetics of the body and mind to promote good health, reduce and eliminate pain and help in recovering process of chronic health issues. The uniqueness of acupuncture treatment is that it restores the equilibrium of the body and mind and is always devised around the personal constitution of the patient, rather then just the symptoms they are experienciing. It can be said that the treatment is aimed at the person and not their ailments, but by so doing, the symptoms are resolved and health restored. Whether you are already receiving medical treatment for you medical condition, want to try another route alongside your conventional medical care, or want to take a completely new approach to your health choosing acupuncture as your main treatment, you will benefit from this fantastic medicine model. Acupuncture has been studied and researched much more in the past 30 years, and is acknowledged for its beneficial effects in treatment of low back pain, migraine, in support of IVF, digestive issues and we now see significant increase in patient referrals from general practitioners, gynaecologists and fertility specialists. What happens when I go for acupuncture treatment? The acupuncture treatment is based on inserting fine, hair thin needles into certain points on the body to stimulate healing process or reduce pain. Combination of points in a prescription is assessed according to a very specific diagnosis, following taking extensive medical history, observation of the pulse and tongue, and gentle abdominal palpation. We discuss details about lifestyle, diet, exercise, previous medical history and significant medical procedures, if any, sleep patterns, digestion, bowel movements, any pain and its location and, if you are a woman, details about your menstrual cycle. 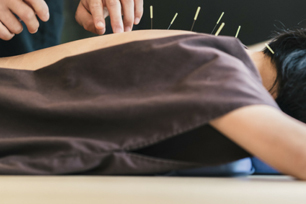 Acupuncture prescriptions are reassessed and and re-valued at subsequent sessions and may or may not change, according to changes to pulse, tongue and palpation diagnosis. During the treatment, the sensation felt following the needle insertion is described as a tingling or dull ache. The needles used are single-use, sterile and disposable and the common post-treatment response is to feel calm and relaxed. Other responses to treatment can sometimes include tiredness or mild dizziness, and on occasion minor bruising may occur. However, all such reactions are are rare and short-lived. How many sessions will I need to notice an improvement? Frequency and length of treatment depends on your individual condition. Some change is usually felt after five treatments, but for chronic issues, I may recommend a course of ten. Some patients may need treatment over several months or long-term. If you are looking to improve aspects of your fertility, it is recommended to have acupuncture for at least three months prior to conception, either naturally or through ART, such as IVF. This can improve hormonal balance and regulate your period, as well as improving the quality of your eggs, which is actually determined three months in advance of conception. When you decide to try acupuncture, go for a properly qualified (to a BSc degree level or equivalent), insured and experienced practitioner and always ask questions related to your specific situation. Have a chat over the phone, or go for an informal chat in person-many of us offer this service to you before you commit to starting your treatment. It is important that you feel good about your chosen acupuncturist as you will be forming a partnership in which you have to be comfortable to share personal information and feelings, which in turn will speed up the process of improving your health. And enjoy acupuncture, it will gently steer your body into what it knows so well - to heal itself.